Did you know that elephants purr? Yes, a bit like a cat! I learned so much investigating my painting subject for this month’s series. They are such magnificent creatures you can’t really help being curious, can you? Aside from the iconic trumpet blast that we know, elephants not only purr but are thought to communicate with one another over long distances using a subsonic rumble. These messages travel faster over the ground than sound through air and are detected through their feet and trunks. Elephants are the only mammal that cannot jump. And even when they run (which they can do at up to 25miles (40km) per hour) they always keep one foot on the ground at all times. So maybe that’s how you get to be a symbol of groundedness and wisdom…. Elephant tusks are continually growing, so the older the elephant the longer the tusk. Just like most of us, elephants are not ambidextrous. A ‘righty’ will wear down the right hand tusk quicker than the left as they favour it for picking things up, stripping leaves from trees or fighting. I can’t say I ever thought much about elephant toes until now, but did you know that elephants actually walk on their toes? Yes, big as they are research shows that they put the most pressure on the outer toes of their front feet and the least amount of pressure on their heels as they walk. Asian elephants might have smaller tusks, but they actually have an extra toenail on each foot compared to African elephants. All elephants have one more toenail on the front feet than they do on the back feet. We all have our weaknesses, but did you know that the mighty elephant’s weakness is the humble bee? Apparently elephants are instinctively afraid of bees. (I just decided I love them even more.) Conservationists use this to their advantage by placing bee hives around land that they need to keep elephants clear of. A fear of bees feels like a very human thing to me, and it is not the only human-like trait that elephants exhibit. They are very social creatures that form tight knit family groups lead by the oldest, often largest female. Go girls. They are remarkably caring creatures. 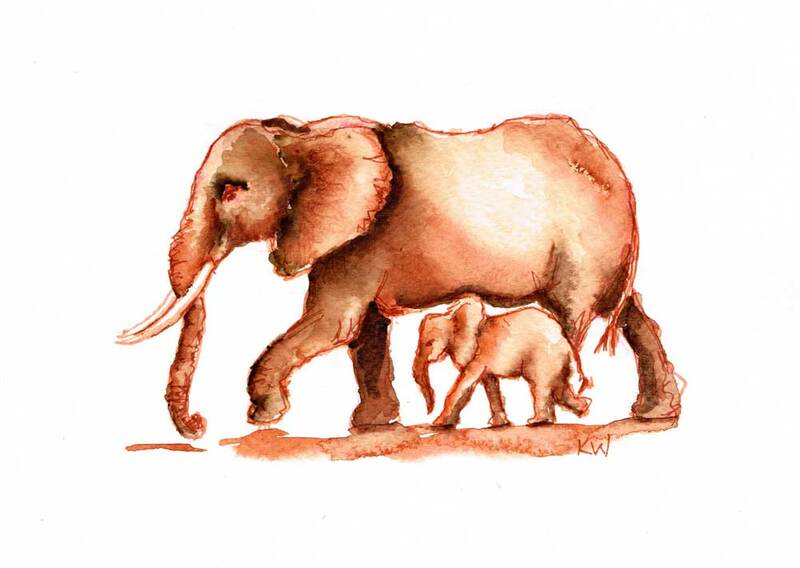 When a baby elephant cries all of the herd will go and tend to it, not just the mother. They also greet other herd members with touch, even wrapping their trunks around each other. Elephants grieve. When one of the herd dies they show signs of sadness and grief and they mourn the loss of the loved one for many years after passing. Using their feet and trunks they gently touch the skulls and tusks in homage when they come across the bones of their dead. When an elephants passes through a place where a loved one once died, it will stop. Its silent pause of remembrance can last for several minutes. Elephants certainly are one of the world’s treasures. There is something so special about them which I don’t think I can do justice with words, but Peter Matheisson did. I have spent a thoroughly lovely month learning about them and painting them. 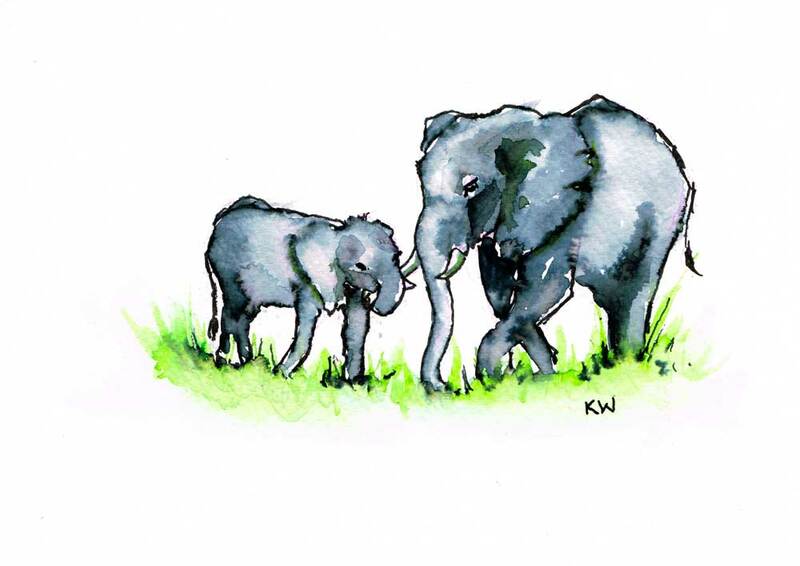 Want to paint elephants with me? 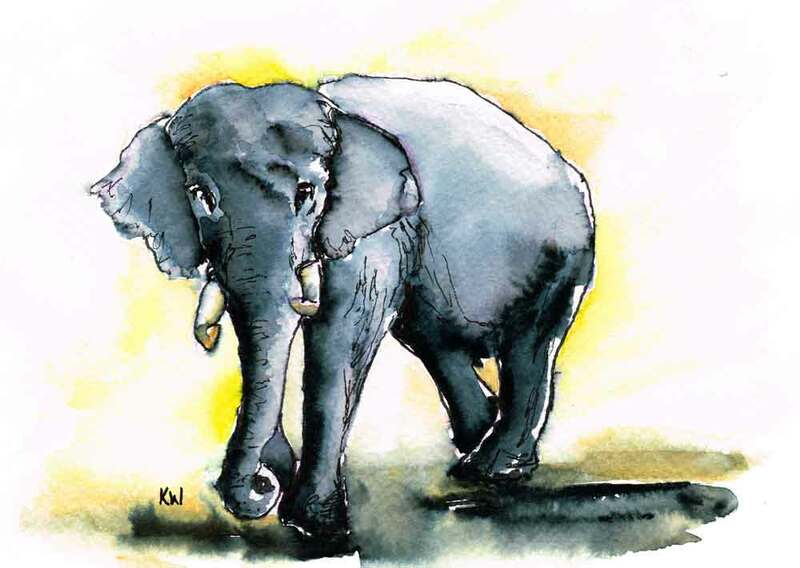 I chose very simple supplies making these elephants an easy painting project even if you are new to watercolour or a reluctant sketcher.